In this paper we propose a new test for efficiency of spot and forward markets where returns are nonstationary and cointegrated. The test for market efficiency is developed within the framework of a vector error correction (VEC) representation of a bivariate vector autoregression (VAR) model. The proposed test includes some of the popular regression-based tests as its special cases. We then apply the test to the Canadian Treasury bill returns. The data used are average yields of three- and six-month Treasury bills at the last tenders of each month from January 1960 to February 1998. Test results indicate that the bill yields are I(1), cointegrated, and consistent with the bill market efficiency hypothesis. Park, Soo-Bin. (1999). 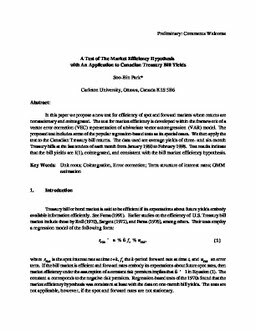 A Test of the Market Efficiency Hypothesis with an Application to Canadian Treasury Bill Yields (No. CEP 99-03). Carleton Economic Papers (CEP). Department of Economics.